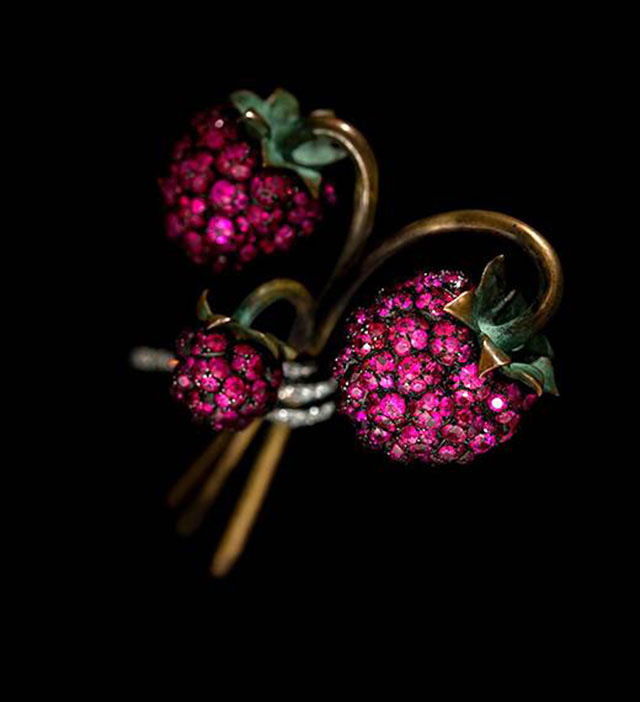 If you love jewelry—and many of us do—hurry to the Metropolitan Museum and visit Jewels by JAR. For a short hour you’ll escape the real and virtual miseries of the world and reside in a wonderland of colors, glitter, larger-than-life butterflies, microscopic carrots, raspberries, rams, and rabbits. I am a jewelry hound in love with the master goldsmiths of the past, with Tiffany, Fabergé, Lalique, and Cartier, as well as with the less famous practitioners who supplied me with my own beloved baubles. Yet until now the name of Joel A. Rosenthal (JAR) had passed me by. He was born in the Bronx seventy years ago, went to the High School of Music and Art, followed by Harvard, and ended up in Paris. One of his early jobs was designing petit point slippers for Hermès. When JAR turned to jewelry, he created miniature mosaics (pavé is the technical term) from diamonds, rubies, and other precious and semiprecious stones. Sometimes he wound single strands of his jeweled threads around the surface of large beads or used them to frame the edges of fan-like pieces of mother of pearl. Many of JAR’s pieces are large, and I was imagining the aplomb of the women who dared wearing them. Not all of his raw materials are precious. A brooch of long red coral spines resembles an angry sea urchin. A huge red tulip evokes Tiffany’s famous diamond and sapphire iris, now owned by the Walters Art Museum in Baltimore. But most of the jewels—that word is derived from the French one for toy: jouet—are reminiscent of Fabergé’s intricate confections. I loved the delicately tinted flowers, the flight of thirty butterfly brooches, and the two elephants, one very natural with agate tusks and a tiara of diamonds, the other covered with a blanket of pearls and jewels. Pearls also made up the tousled bangs of a disgruntled sheep’s head. All the pieces are one of a kind, often specifically made for well-endowed clients. I wonder who owned the giant black feather-and-diamond earrings the jeweler must have designed with Tchaikovsky’s Black Swan in mind, or the asparagus tip brooches displayed in the cabinet of food-based jewels? When it is time to leave the show’s enchanted atmosphere and return to the here and now, visitors exit through the gift shop, which sells a two-volume set of books with lovely images of the four hundred pieces of jewelry from the entire exhibition. At $200 per volume I opted out, but promised myself to return before the show closes in March 2014. This entry was posted in Art review and tagged art, cartier, fabergé, jar, jewelry, jewels by jar, joel a rosenthal, lalique, metropolitan museum of art, new york city, nyc museums, paris, tiffany, walters art museum. Bookmark the permalink.